Everything has its place – whether it is files or supplies, personal items or cleaning utensils. 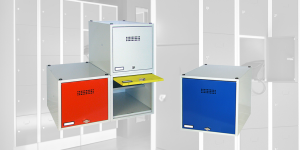 Our filing and multipurpose cabinets are available as differently equipped models. They all come in the same look and with effective theft protection thanks to standard 3-way locks. Double doors with vertical box reinforcement, fastened to sturdy interior hinges. 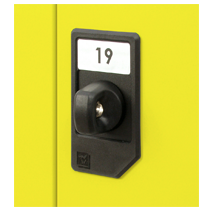 Lockable with plastic turning handle with security cylinder lock, 2 keys and 3-way lock. 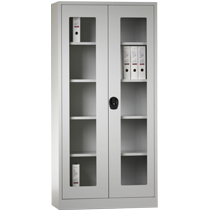 Interior design either as material filing cabinet, clothes cabinet, laundry cabinet or as material cabinet with separately lockable safe. Extensive equipment and accessories range such as master key system, additional shelves or acrylic glass doors. Double doors fastened to sturdy interior hinges. Lockable with security cylinder lock, 2 keys, 1- or 2-way lock. Drilling in the back wall for wall mounting. High-quality stove-enamel, various full finishes as standard selections, special finishes possible on request. 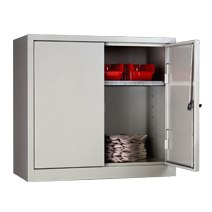 Extensive equipment and accessories range, cabinet bolt for padlocks, main locking system or additional shelves.